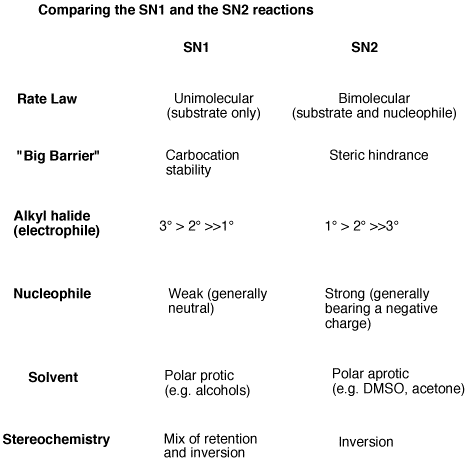 Since we’ve gone through the different factors that impact the SN1 [see post] and SN2 [see post] reactions, it’s worthwhile to review and summarize the different factors behind each of these two reactions. But first – have you ever heard the story of the cats and the comfy chair? Illustration by the talented Canadian political cartoonist Graeme Mackay. Thanks Graeme! Cat #1 finds Cat #2 on his comfy chair and wants to sit. He has two options. He can wait for Cat #2 to leave, and then sit in the comfy chair. He can kick the Cat #2 out of his comfy chair. Think about that for a second. In the meantime, let’s compare the SN1 and the SN2. The SN2 reaction is concerted. That is, the SN2 occurs in one step, and both the nucleophile and substrate are involved in the rate determining step. Therefore the rate is dependent on both the concentration of substrate and that of the nucleophile. The SN1 reaction proceeds stepwise. The leaving group first leaves, whereupon a carbocation forms that is attacked by the nucleophile. This is the most important thing to understand about each reaction. What’s the one key factor that can prevent this reaction from occurring? In the SN1 reaction, the big barrier is carbocation stability. Since the first step of the SN1 reaction is loss of a leaving group to give a carbocation, the rate of the reaction will be proportional to the stability of the carbocation. Carbocation stability increases with increasing substitution of the carbon (tertiary > secondary >> primary) as well as with resonance. For the SN2, since steric hindrance increases as we go from primary to secondary to tertiary, the rate of reaction proceeds from primary (fastest) > secondary >> tertiary (slowest). Remember that SN1 and SN2 reactions only occur for alkyl halides (and related compounds like tosylates and mesylates). If the leaving group is directly attached to an alkene or alkyne, SN1 or SN2 will not occur! The SN2 tends to proceed with strong nucleophiles; by this, generally means negatively charged nucleophiles such as CH3O(–), CN(–), RS(–), N3(–), HO(–), and others. The SN1 tends to proceed with weak nucleophiles – generally neutral compounds such as solvents like CH3OH, H2O, CH3CH2OH, and so on. The SN2 reaction is favored by polar aprotic solvents – these are solvents such as acetone, DMSO, acetonitrile, or DMF that are polar enough to dissolve the substrate and nucleophile but do not participate in hydrogen bonding with the nucleophile. The SN1 reaction tends to proceed in polar protic solvents such as water, alcohols, and carboxylic acids. These also tend to be the nucleophiles for these reactions as well. Since the SN2 proceeds through a backside attack, if a stereocenter is present the SN2 reaction will give inversion of stereochemistry. By contrast, if the SN1 leads to the formation of a stereocenter, there will be a mixture of retention and inversion since the nucleophile can attack from either face of the flat carbocation. So does the story about the cats and the comfy chair make sense now? In the SN2, the nucleophile (Cat #1) forms a bond to the substrate (comfy chair) at the same time the leaving group (Cat #2) leaves. In the SN1, the leaving group (Cat #2) leaves the substrate (comfy chair), and then the nucleophile (Cat #1) forms a bond. If this makes sense, you might be ready for the Quick N’ Dirty Guide to SN1/SN2/E1/E2 reactions. Otherwise, join us for our next post when we discuss rearrangement reactions. UPDATE . The most perfect cat video ever. Thanks to Alex Roche (Rutgers U.) for sending. What Makes A Good Nucleophile? Acid Base Reactions: What's the Point? Acid Catalysis Of Carbonyl Addition Reactions: Too Much Of A Good Thing? Crystal clear. Beautiful analogy. Here comes James, frighten the poor hobo away so he can seat himself on the bench. James must be big and intimidating. I can’t claim credit for the analogy – I heard it secondhand. But it’s effective isn’t it? It is and thanks for making it comprehensible. I v already covered this with my students but I ll use this to refresh them again. add more Nu? No help. For the SN2, since steric hindrance decreases as we go from primary to secondary to tertiary, the rate of reaction proceeds from primary (fastest) > secondary >> tertiary (slowest). Fixed. thanks for pointing that out! actually steric hinderence increases as we move from primary to secondary. hope this will help…. Hey, just a question here. I know that the branching of the base/nucleophile will direct the reaction towards E2 or Sn2, where steric hinderance of the base/nu: will most likely lead to an E2 rxn, b/c the H+ protons are more accessible. Does branching of the base/nucleophile have any affect on E1 or Sn1? Since the rate-determining step of SN1 and E1 reactions is formation of the carbocation, an event independent of the nucleophile, branching of the base/nucleophile does not have a significant effect on these reactions. Well actually the branching of a base/nucleophile can have an effect. Lets think about the carbocation during its transition state. It positively charged and thus in an ideal world it would want to be stabilised, thus reducing its energy. If you have large bases this can almost protect the transition state, providing mixed effects with the stabilisation of the cation being good, the steric hindrance for the nucelophile being bad. Thanks very much, this was a great review of the topic! in problem 10 you mention that allylic halide is more reactive and rxn is SN2. Allylic system are more reactive becoz of resonance for which there must be formal charge intermediate as in SN1 not SN2. So why is it that without any charged intermediate the left bromine is favored. This was so outrageously helpful. I will definitely be using this site for much of my orgo work this year. Thank you, very glad to hear it. Sir Thank you, I was looking for this article. You’d explained it very nice. Even my teacher couldn’t. Sir will you please explain me why alpha-halocarbonyl compounds are not much reactive with Sn1 mechanism? The carbocation that forms is destabilized by the adjacent electron withdrawing C=O group, making this a very unstable carbocation. Thank you sir, it was very helpful. in General chemistry, there is chapter about kinetics. If you guys are confused about rate determining steps, I would encourage reading that chapter or review it thoroughly. I will try to explain it here a little. Since the rate determining steps depend on the carbocations, so we look at 1st order kinectic , which can be found by. k= [Electrophile] , where k is rate of reaction , as the the concetration of electrophile goes down, the reactions is reaching towards end, or stopping or decreasing, whatever you think is appropriate at given electrophile concentration. 2) SN2, you will need good Nuceophile and electrophile, thus intermediate stage is 5 ligands, and conculsion is four , sp3 to sp3, but remember it does have 5 ligands, intermediate, which is VSPER Theory, 5 ligands, is Trigonal bipyramidal. k is rate of the reaction, depends on both electrophile and nucelophile, so it is second order, 1 step, fast reaction. So as the both increases the reaction rate will go up, if one goes down, it is kind of like limited reagents , which one exhaust first etc, if one is exhausted, does not matter, how much you have the other, the reaction WILL NOT Proceed. This was so helpful!! I love how simple you break it down. THANK YOU SO MUCH!!! I’m studying Organic Chemistry from Clayden, but I really like this website to have some extra background, mnemonics and nice summaries. I wanted to check the exercises pointed out at the end of this lecture, but the link gives an error (404 – File or directory not found.). Glad you were well prepared! Thanks for the write up. Truly helpful. Thank you so much for the nice explanations. Your explanations helped me get several difficult points cleared. Thanks for the great explanation. I have a question about the rate of Sn1 reaction, how would a primary carbocation that can undergo an alkyl shift to become tertiary fit in, I know that a primary carbocation is slower than secondary, but the shift would stabilize it. Or does the shift take enough time that it wouldn’t end up being faster than a secondary? If talking about the rate of formation of a free carbocation, formation of primary carbocations is slower than that of secondary. However, it is very rare that primary carbocations form – when alkyl shifts occur to a primary carbon, it is usually a concerted rearrangement mechanism that doesn’t strictly go through a free carbocation. That makes it difficult to strictly compare the rates since they occur through different mechanisms. What’s with the hobo story huh? This is absolutely wonderful resource! I understand it now, and it’s nowhere as complex that my lecturer made it look! Glad you found it useful Michal! Hello, I have a question about steric hindrance for an Sn2 reaction. Specifically with cycloalkanes. I thought that the higher the number of carbons a cycloalkane has (the more corners it has) the more likely it was for a nucleofile to attack it from the inside. In my chemistry book on the other hand there’s a table with relative reactivity. And it puts Cyclopentane (more reactive) before Cyclohexane. Why doesn’t this one follow the rule? Many thanks in advance! Love your website! Hi – not sure exactly what you mean by the “inside” . In the case of cyclopentane and cyclohexane, the ring isn’t big enough for the nucleophile to fit in the “inside” of the ring. Hard to say re: cyclopentane vs. cyclohexane. I can’t imagine there’s a huge difference. cyclohexane has the barrier of requiring the leaving group to be axial. Could it have something to do with angle strain? increased angle strain in the cyclopentane could lead to a higher energy of the starting materials, and thus, a lower barrier to cross to undergo an SN2 reaction? This analogy is fab…Its so clever and easy to remember! Thank you so much…I made use of it in my oxford interview! It is very un-PC to be using homeless people in this analogy, imagine if you changed the analogy to a black person on the bench and a white person wanting to sit down (quite offensive). You have a cartoon of two cats wanting to sit in a basket, why not just use that analogy; how about just two people, one sitting on the bench and the other wanting to sit on the bench, no socio economic issues implied. Apart form that very useful information. Which one allows for a better control over the configurations of products SN1 or SN2? SN2, of course, because it is stereospecific. Thanks for this great explanation! If you didnt know whether the reaction was Sn1 or Sn2, what physical property could you use to distinguish them? If it’s a chiral secondary alkyl halide, then you could use optical rotation to distinguish them. Great analogy and summary! Thank you so much! I shall definitely be reading more of your work! But I am little bit confused in trend of nucleophilisity of halogens in polar aprotic solvents. what is the reason for the recemized product in SN1 reaction? to be precise with the question.. the no. of front side and back side attack is same. why it doesn’t differ? Even with the help given, I am having trouble with how kinetics can be used to tell the difference between SN1 and SN2. Double the concentration of substrate and double the concentration of nucleophile. If the reaction is first order overall, the reaction rate will only double. If the reaction rate is second order overall, the reaction rate will quadruple. why tertiary alkyl halides prefer nucleophilic reactions more easily via sn1 mechanism ? Carbocation stability is the brief answer. Personally, I think steric effects should also be considered. thank you so much this was the best help i could find on the subject – turned me around on understanding substitution rxns!! Studying for my DAT and this gave so much of everything I needed and nothing I didn’t! Thank you! Glad to hear it, Tye! I’ve taken it down. ASU has changed their website. What about the effect of the polar aprotic solvent on the rate of rxn? That’s a valid question, and it’s unfortunately not addressed. I’d love to see direct data on that. At the moment I haven’t been able to find anything that would provide a direct comparison. If I do, I’ll put it in. SN1 mechanism — the rate of reaction depends on substract. It is independent of nucleophile. So it can show ist order mechanism (unimolecular). It is more than 1 step mech. Most stable carbo cation will favour sn1 mech. More steric hindered can show sn1 mech. I know primary substrates favor SN2 and E2 reactions – but my book talks about how a primary carbocation can form in an SN1 reaction if it is accompanied by a simultaneous rearrangment. The book specifically says it can happen as a result of a methyl shift. My question is: can it also happen via a simultaneous hydride shift? Or only through a methyl shift? My teacher has given us some problems to work through that would require a primary carbocation to form through a hydride shift, and I just want to make sure that is feasible. Yes, it can certainly happen through a simultaneous hydride shift. Thank my cousin Graeme for that, ha! Thank you so much for great revision of Sn1 and Sn2 reactions .! Thank you very much for your views regarding the Sn1 and Sn2 reaction……..This will help me alot….. Thank you so much for supporting the site Cacia! This is very impressive. I’m having a Msc. In applied organic chemistry. And it helped me to explain this to my students. 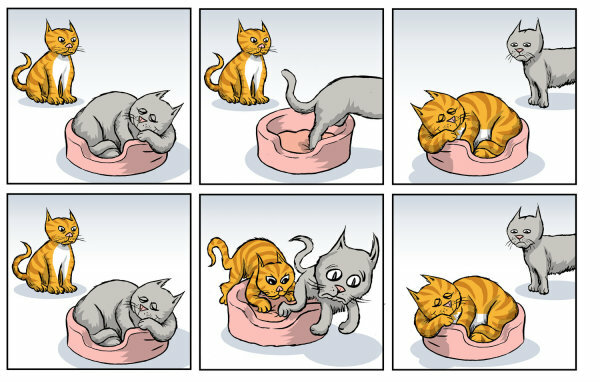 The cat example is nice. Thank you. Your website is a Godsend. Thank you! Or just tehe cis ones react because its possible ” the carbon bonded to the leaving group is attacked by the nucleophile on its back side”? How do we know if its possible to have the mixture of the 2 configurations? It’s completely possible. With cyclohexanes, the important thing to note is that the leaving group must be axial in order for the SN2 to occur. Wow.this is very useful site for everyone but please add reactions with mechanisms..
Glad you find the site useful Shailenda! Your blog posts are so helpful, please keep doing what you’re doing! Also love the summary sheet for this subject, super helpful as well. Glad you found it useful Ky! Wonderfully describe. I am a chemistry teacher; I teach that topic to my students as per your article. I like your way of understanding. Thank you so much for sharing your this information about two reactions. Why reactivity in SN1 reaction is directly proportional to the on stability of carbonation ? And how ?